This is the list of games we have developed. Please feel free to download them and put them on your site or blog. Feel free to send us Your games! Description:Santa Claus in his sledge is running to collect all the presents. After that, he must rich the city to deliver them. But the ugly Grinch wants to still the presents and ruin the Christmas Eve. Either way, you believe or not in Santa Clause, you must play this game and test your skills. Controls:Use mouse click to keep Santa in the air. Collect the gifts and avoid Grinches. Description:TMNT are back in Bike Zone. They located the perfect place for training, dump full of trash for obstacles. The obstacles are hard, but fun, because there are pizzas to collect! Choose your hero, give a speed (use space bar), jump and use extra powers (Press x). Good luck! Controls:Use Right arrow to accelerate. Press Up arrow to Jump. Press Space to Shoot. Press X to Use Item. Description:SpongeBob wanted to defeat his fears from ghosts and cemetery so he invited his friend zombie to visit the cemetery with him. They have a lot of obstacles and fears to face. Play with them and face your own fears. Controls:Press Left/Right/Up arrow key to Zombie. Press Down arrow key to shoot. Press AWD to control SpongeBob. but exciting ride.Controls: Use left/right arrow keys to aim. Press space bar to shoot. Description:One day at a leisure time, Smurfs got an idea to make a joke of Gargamel! Title: Hungry GreenyDescription: Meet the cutest and slimiest creatures: Greenies! Little Greeny is very hungry. Mama Greeny spotted Toothy birds in the sky. She will shoot the birds with her nozzle full of slime…yuck! Gross. Help Greenies to shot the birds in the sky. You have got 30 seconds and limited number of attempts to shoot all the birds. Good luck! Title: Sonic Extreme RunDescription: Welcome to the Sonic Extreme Run! Help Sonic to accomplish his task. He has to collect as much gold rings as he can in shortest time possible, while avoiding dangerous creatures. Try to get to the end and set the record. Are You up to it? Can You survive all the challenges? Title: TMNT Bike ZoneDescription: Teenage mutant ninja turtles are entering the bike zone! Turtles have a day off, after defeating Foot clan, so they decided to practice theirs bike riding skills. Splinter has made paths with different obstacles. So guys lets go on biking with TMNT in the bike zone. Title: Super Pilot BattleDescription: Enter the Super Pilot Battle! During the World War 2, captain Joe was on a special mission, but his plane crashed among dangerous Andes. He needed to think of something fast, so he built up his aircraft – all by himself. So, he is back to the war and he needs your help to navigate him. Shoot the enemies, pick up upgrades and try to stay in the air as long as possible. Have fun! Title: Vintage Formula 7Description: Welcome to the retro formula drive! This Vintage Formula 7 has really good performances. It is stable, fast and the best of all, it offers enjoyable ride. Try to collect the hearts whole balancing the formula. Collect all this hearts and be careful: do not jump too high, you’ll crash the formula. Have a lot of fun! Title: Treasure Island DefenceDescription: In the year 1655. the whole Carolina coast was full of pirates. The famous captain Blackbeard was defending his island full of treasure. Eliminate all the ships to advance to next level. Use the bomb if there are too many ships. Good luck! Title: Minion Island AdventureDescription: Minion is on the special mission! He is at the Vector’s tropical island. He must collect all the diamonds and go to the raft in order to complete the mission. But, that will not be an easy job, as diamonds are guarded by evil Minions. Good luck! Title: Scooby Doo Space JumpDescription: Scooby Doo and friends are in the space. Their mission is to collect lost ghosts. Scooby must defeat phantom, Space Ape and Space Kook. He is using his dog powers and space gun to defeat this ugly guys and jump into his spaceship. 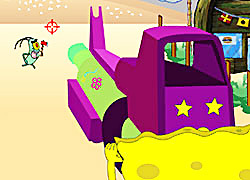 Title: SpongeBob ShootoutDescription: Guys, get ready for SpongeBob shootout! Plankton created army of evil clones in order to conquer Krusty Krab restaurant. SpongeBob must defend the restaurant and take out all the clones! Kill all the clones to advance to next level. Don’t forget to use the bomb to disable vehicles! Good luck! Title: Bart Simpson Against the MonstersDescription: You are in a Bart Simpsons’s dream! Monsters abducted Maggie, Bart’s little sister. Bart on his skate turns monsters into a smilies by throwing smiling bombs on them . Help Bart to overcome all obstacles on his way to save Maggie from the monsters. Title: Sonic Stars Race 2Description: Sonic and friends are back! Race in classic Sonic surroundings and try to win all the races. You can freeze your opponents with special laser ray. Try to collect as much coins as possible, because if you collect enough of them, you get special upgrades: acceleration or shield. You can choose your character between Sonic the Hedge, Rouge the Bat, Knuckles the Echidna and Egg Man. Have fun! Title: Crazy FlyDescription: Hey Guys, this fly is really crazy! She’s very bad in flying, but she don’t want to miss anything. She follows animal droppings, but she’s crazy for honey and strawberries. Jump on to turtles and lizards to disable them. Watch out for a dangerous frog or you will be eaten! Her enemies are also hornets and birds. Go fly, but be careful, don’t drop into the water. Have fun! Title: Minion the PlumberDescription: A big disaster struck the Minion town! Some pipes burst in the sewer and flooded the whole city. Minion the plumber must find the solution, but a mouse, monkey, worm, fire ball and the bats are his enemies who want to stop him. But the good thing is that he has a special suitcase fool of food which gives him extra power! Go Plumber, save the city! Title: Spiderman Dangerous RideDescription: Spiderman is on the dangerous missions to save the city from the evil forces. He is far away from New York, but he must reach it until the sun goes down. He is driving motorbike in opposite direction and he must avoid crashes with cars and Rhino, his dangerous enemy. Enjoy Spiderman Dangerous Ride! Title: Sonic In the AirDescription: Guide Sonic through the great flying adventure! Sonic is the pilot and his mission is to collect as much emeralds as he can. Keep Sonic in the air as long as possible, while dodging Eggman’s aircraft’s at the same time. If you go too high or too low, you’ll crash! How long can you last? Enjoy! Title: Minion the AstronautDescription: This time minion is on special mission to discover planet Mars. He is curious what kind of living things he will meet there. Are you curious too? He has his special astronaut suite, magnifier and phone which teleport special candies that gives him extra powers. Try this exciting excursion to Mars and find out who is waiting for you there. Title: SpongeBob Circus RideDescription: SpongeBob wants to join Circus as a clown! However, he must pass the ultimate test first: riding special circus bike without falling. He must pop as much balloons on the way as he can. Help him to finish his ride successfully. Enjoy SpongeBob Circus Ride! 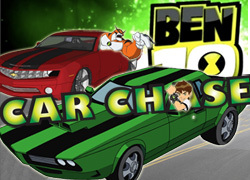 Title: Ben 10 Car ChaseDescription: Ben 10 must save the Earth again! Dangerous aliens, disguised as humans, are on their way to capital city. Ben 10 must chase them and destroy their cars. Drive your car carefully because each time you hit another car, you lose energy. Try to collect as much energy on the way as you can. Good luck with your Ben 10 Car Chase! Title: Smurfs Fun Race 2Description: Smurfs Fun Race is back and it’s funnier than ever! Smurfs challenged Gargamel to race and collect magic potion for making gold coins. Choose your character between Papa Smurf, Smurfette, Vanity Smurf and Gargamel. Try to collect as much magic potion as you can. Enjoy! Title: Sonic Love HunterDescription: Sonic went looking for a love in the beautiful city of Sunrise. In one of his adventures, he ran into a beautiful Amy the hedgehog, but he is to shy to show her his love. Vector the Crocodile abducted Amy and captured her in his castle. Sonic has to pass through variety of obstacles to save Amy and show his hidden love. Title: Smurfs Fun RaceDescription: Deep in the woods lives small smurfs always hunted by big Gargamel and his cat Azrael. Smurfs challenged Gargamel to race and collect magic potion for making gold coins under one condition for Gargamel to become a small as a smurf during the race.Choose your character, collect magic potion and have a fun!